ICANN Policy Update is available in all six official languages of the United Nations. Policy Update is posted on ICANN's web site and available via online subscription. To receive the Update in your Inbox each month, visit the ICANN subscriptions page, enter your e-mail address, and select "Policy Update" to subscribe. This service is free. Send questions, comments and suggestions to: policy-staff@icann.org. Internationalized Domain Names Variant Issues Project: Draft Integrated Issues Report. This draft report summarizes the findings of six case study teams that examined the range of variant issues associated with scripts such as Arabic, Chinese and Devanagari when included in the Domain Name System root zone. Closes 30 January 2012. Framework for the FY13 Budget. This is the beginning of the operational planning process for ICANN, providing the community a first look at the plan and estimated financial resources for FY13. Closes 23 February 2012. Initial Report on Universal Acceptance of Internationalized Domain Name TLDs. The Ad Hoc ccNSO/GNSO Joint IDN Working Group has identified policy and coordination considerations to be addressed regarding how to work with Internet infrastructure operators and application providers to ensure they are prepared to support Internationalized Domain Names. Closes 7 March 2012. Whois Policy Review Team Draft Report. This draft report takes a broad look at ICANN's Whois policies and procedures and makes recommendations for improving compliance. Closes 18 March 2012. For the full list of issues open for public comment, plus recently closed and archived public comment forums, visit the Public Comment web page. The country code operator for Iraq was approved as a ccNSO member in December. The ccNSO Council approved the ccTLD operator, Communications and Media Commission, of .iq (Iraq) as a new ccNSO member. Iraq is in the Middle East, bordering the Persian Gulf, between Iran and Kuwait. There are now a total of 124 ccNSO members. In calendar year 2011, 14 new members joined the ccNSO. The ccNSO Finance Working Group is surveying the ccTLD community about financial contributions. In December 2011, a survey was distributed to each ccTLD's administrative contact on how ccTLDs contribute to ICANN and what contribution models are used for this. The survey will also measure the ccTLDs' views on the services ICANN provides to them. This survey will help the ccNSO Finance Working Group in its work to examine what contribution models exist today and what contribution models potentially could be used. All ccTLDs are encouraged to reply to the survey. In case the survey has not reached your ccTLD, please contact the ccNSO Secretariat. The ccNSO Finance Working Group's objective is to discuss with ICANN what resources are attributed and how they are allocated. This will assist in developing a methodology for individual ccTLDs to use to calculate a fair and equitable voluntary financial contribution to ICANN and to ultimately propose such a methodology to the ccTLD community. The survey will help the Finance Working Group in its work to examine different contribution models and to understand the services the ccTLD community is receiving from ICANN. The Framework of Interpretation Working Group (FoI WG) has finalized its recommendations on the first of five topics it is examining related to ccTLD delegations and redelegations. The FoI WG has completed its Final Report on obtaining and documenting consent from proposed and/or incumbent operators for ccTLD delegations and redelegations, and will submit the document to the GAC and ccNSO to seek their support. The WG has also concluded its discussion and public consultation on description and documentation of support for delegation and redelegation by Significantly Interested Parties (also referred to as the Local Internet Community). Examples of Significantly Interested Parties are those that are relevant in the case of the delegation and re-delegation of Internationalized Domain Name ccTLDs. The WG will publish its Interim Report on Significant Interested Parties for public comment, and it has started discussion on its third topic – redelegation without consent. Any proposal to amend, update or change the Policy Statements is outside the scope of the FoI WG. The IANA functions contract between the U.S. Government and ICANN (including any contract implementation issues or procedures relating to it) is also outside the scope of the FoI WG's work. Obtaining and documenting consent for delegation and redelegation of ccTLDs. Obtaining and documenting support for delegation and redelegation requests from Significantly Interested Parties (sometimes referred to as Local Internet Community or LIC). Developing recommendations for "un-consented" redelegations. Developing a comprehensive glossary of the terms used for the delegation and redelegation of ccTLDs. Developing recommendations for IANA reports on delegation and redelegation. At the request of the ICANN Board, staff published a Preliminary Issue Report that evaluates the policy implications of a list of recommendations developed by law enforcement agencies and the broader Internet community to amend the Registrar Accreditation Agreement (RAA) to provide increased protections for registrants and greater security overall. ICANN staff has published a Preliminary Issue Report [PDF, 414 KB] recommending that the GNSO Council commence the Board-mandated policy development process (PDP) on proposed amendments to the Registrar Accreditation Agreement on an expedited basis. The Public Comment period seeking input on the report closed on 13 January 2012. A Final Issue Report will be published prior to the ICANN Public Meeting in Costa Rica in March 2012, as a first step before the GNSO Council begins a PDP on the proposed amendment topics. In 2009, the GNSO Council embarked on a collaborative process with the At-Large Advisory Committee regarding the Registrar Accreditation Agreement (RAA). As part of this process, a joint GNSO/ALAC drafting team (known as the RAA Drafting Team) was formed to conduct further work related to proposals for improvements to the RAA. The RAA Drafting Team reviewed proposals from the law enforcement community, the Intellectual Property Constituency, as well as other stakeholders, seeking to enhance the RAA. The RAA Drafting Team published a Final Report [PDF, 7.1 MB] that identified potential topics for additional amendments to the RAA, as well as a proposal for next steps for the GNSO Council to consider in determining whether to recommend a new form of RAA. At the ICANN Public Meeting in Dakar, the ICANN Board directed RAA negotiations to commence immediately, and called for proposed amendments to be provided for consideration at ICANN's meeting in Costa Rica in March 2012. The current negotiations include the law enforcement and GNSO Working Group recommendations as well as other topics that would advance the twin goals of registrant protection and DNS stability. The ICANN Board also requested the creation of an Issue Report to undertake a GNSO PDP as quickly as possible to address remaining items as appropriate. The Registrars Stakeholder Group and ICANN are currently in active negotiations on the proposed amendments to the RAA. The aim of the Inter-Registrar Transfer Policy (IRTP) is to provide a straightforward procedure for domain name holders to transfer their names from one ICANN-accredited registrar to another. The GNSO Council is reviewing and considering revisions to this policy through a series of Working Groups. The IRTP Part B PDP Recommendations have been adopted by the ICANN Board and will now move forward to implementation. The IRTP Part C Policy Development Process is underway. IRTP Part B: In addition to those recommendations that are now in the process of being implemented, the GNSO Council requested ICANN staff to provide proposals for consideration regarding two of the recommendations of the IRTP Part B Working Group. These two recommendations relate to standardizing and clarifying Whois status messages regarding Registrar Lock status and a new provision in a different section of the IRTP addressing when and how domains may be locked or unlocked. Following consultations with the IRTP Part B Working Group, the ICANN staff proposals were put out for public comment. No public comments were received and the proposals have now been submitted to the GNSO Council for consideration at its next meeting. "Change of Control" function, including an investigation of how this function is currently achieved, if there are any applicable models in the country-code name space that can be used as a best practice for the gTLD space, and any associated security concerns. The investigation should also include a review of locking procedures, as described in Reasons for Denial #8 and #9, with an aim to balance legitimate transfer activity and security. Whether provisions on time-limiting Forms Of Authorization (FOAs) should be implemented to avoid fraudulent transfers out. For example, if a Gaining Registrar sends and receives an FOA back from a transfer contact, but the name is locked, the registrar may hold the FOA pending adjustment to the domain name status, during which time the registrant or other registration information may have changed. Whether the process can be streamlined by a requirement that registries use IANA IDs for registrars rather than proprietary IDs. A Working Group was formed and as its first task the WG opened a Public Comment forum to obtain community input on these Charter questions to help inform its deliberations. One contribution was received. The WG will now review this contribution as well as other statements received from GNSO Stakeholder Groups, Constituencies, other Supporting Organizations and Advisory Committees as part of its deliberations to develop an Initial Report addressing the charter questions outlined above. 'Thick' Whois Issue Report: As recommended by the IRTP Part B Working Group, the GNSO Council resolved at its meeting in September 2011 to ask ICANN staff to prepare an Issue Report on the requirement of 'thick' Whois for all incumbent gTLDs. Such an Issue Report and possible subsequent Policy Development Process should not only consider a possible requirement of 'thick' Whois for all incumbent gTLDs in the context of IRTP, but should also consider any other positive and/or negative effects that are likely to occur outside of IRTP that would need to be taken into account when deciding whether a requirement of thick Whois for all incumbent gTLDs would be desirable or not. The Preliminary Issue Report was posted for Public Comment. ICANN staff is reviewing the nine comments received and will update the Issue Report accordingly for submission to the GNSO Council. The IRTP is a GNSO consensus policy that was adopted in 2004 with the objective to provide registrants with a transparent and predictable way to transfer domain name registrations between registrars. As part of its implementation, it was decided to carry out a review of the policy in order to determine whether it was working as intended or whether there are any areas that would benefit from further clarification or improvement. As a result of this review, a number of issues were identified that were grouped together in five different policy development processes or PDPs, titled A to E, that are being addressed in a consecutive manner. The GNSO Secretariat issued a call for volunteers to form a drafting team to develop a charter for a PDP Working Group on domain name locking subject to Uniform Dispute Resolution Policy (UDRP) proceedings. At its 15 December meeting, the GNSO Council initiated a PDP on the requirement to lock a domain name subject to UDRP proceedings. If you are interested in volunteering for the drafting team responsible for developing the Working Group charter, please email the GNSO Secretariat. "No requirement to lock names in period between filing complaint and commencement of proceedings." "Need clarification of domain locking." "Unclear what is meant by "Status Quo." "No explanation of 'Legal Lock' mechanisms and when they go into effect or when they should be removed." "Whois" is the data repository containing registered domain names, registrant contacts and other critical information. The GNSO Council is proceeding with studies to provide current, reliable information for community discussions about Whois. Whois Misuse Study. This study is intended to discover to what extent public Whois information is used maliciously. The Carnegie Mellon University Cylab in Pittsburgh, PA, USA expects to have initial results from the study in late 2012. Whois Registrant Identification Study. This study will examine the extent to which domain names registered by legal persons or for commercial activities are not clearly represented in Whois data. On 28 September, staff announced that NORC at the University of Chicago was selected to conduct this study. Study results are expected in early 2013. Whois Proxy and Privacy Services Abuse Study. Staff is finalizing details of this study, slated to begin in 2012. It will focus on the extent to which domain names used to conduct illegal or harmful Internet activities are registered via privacy or proxy services to obscure the perpetrator's identity. Whois Proxy and Privacy Services Reveal Study. A feasibility study started in July 2011 will determine whether enough willing participants can be found to conduct a larger study measuring proxy and privacy service responsiveness to registrant "identity reveal" requests. Expect to see initial findings early in 2012. Whois Service Requirements Study. On 6 October the GNSO Council approved a charter for a new Working Group to survey community members to estimate the level of agreement with the conclusions and assumptions in the Inventory of Whois Service Requirements – Final Report [PDF, 651 KB]. A draft survey is due to be provided to the GNSO Council by March 2012, with a survey launch thereafter, and a final report targeted for completion by October 2012. The Working Group is composed of community volunteers with technical expertise in the technical aspects of gTLD Whois, survey development, and background on the history of gTLD Whois policy development. Now that IANA has allocated all the addresses in IPv4, Regional Internet Registries (RIRs) have discussed a number of proposed global policies for handling IPv4 address space returned from the RIRs to IANA. Four RIRs have adopted the new policy. Four of five RIRs have adopted a proposal originated by APNIC on the allocation of recovered IPv4 address space. The proposal has also passed the final call stage in AfriNIC. In this proposal, IANA would establish and administer a pool of returned address space to be allocated to all RIRs simultaneously in equal blocks of smaller size than the traditional /8. Pool size permitting, allocations would occur every six months. If and when this policy proposal is formally adopted by all five RIRs, the Number Resource Organization Executive Committee and the Address Supporting Organization Address Council will review the proposal and forward the policy to the ICANN Board for ratification and implementation by IANA. IPv4 is the Internet Protocol addressing system used to allocate unique IP address numbers in 32-bit format. With the massive growth of the Internet user population, the pool of unique numbers (approximately 4.3 billion) has been depleted and a 128-bit numbering system (IPv6) is taking its place. A Background Report for the third proposal is posted on the ICANN web site and includes a comparison between the proposals so far on this theme. Background Report for the second proposal. The Ad Hoc ccNSO – GNSO Joint IDN Working Group (JIG) seeks public comment on its report on Universal Acceptance of Internationalized Domain Name (IDN) TLDs. The JIG is seeking public comment on its Initial Report on Universal Acceptance of IDN TLDs. This report is intended to solicit input from the community on the preliminary stocktaking of policy and other considerations as well as possible actions to be taken by ICANN and the ICANN community to address the issue of Universal Acceptance of IDN TLDs in support of the introduction of IDN ccTLDs and gTLDs. Are there policy aspects to be considered and/or policies to be implemented at ICANN? Registry policies for IDN ccTLDs and IDN gTLDs? With which organizations should ICANN work on the issue and how should ICANN identify such organizations? Emerging de facto industry standards? On which areas should ICANN focus its efforts and exert its influence? On what types of work should ICANN and the ICANN community focus its efforts and priorities? The Public Comment period will close on 7 February 2012 and the WG will closely review all submitted comments to revise and assess its preliminary stocktaking. The purpose of the Ad Hoc ccNSO/GNSO Joint IDN Working Group is to deal with issues related to the introduction of IDN ccTLDs under the IDN ccTLD Fast Track implementation process and IDN gTLDs under the new gTLD implementation process, which are of common interest to both the GNSO and ccNSO. Both the ccNSO and GNSO Council adopted the charter of the JIG. For the past two years a community-wide working group chartered by the ICANN Board has been working to (1) confirm the history, underlying principles and goals of the current geographic regions framework, (2) analyze how those goals and principles have been applied by the Board, staff and community and (3) consulted with the community on how those principles and goals can be best maintained in the future. That Working Group is now reaching the end of its efforts. The Geographic Regions Review Working Group's completed a Draft Final Report and posted it for Public Comment from 1 October through 19 December 2011. The Draft Final Report reflects the penultimate step of the group's research and consultation effort. It outlines specific recommendations from the Working Group to the ICANN Board regarding how the present Geographic Regions Framework can be modified to ensure that the organizational principles of geographic and cultural diversity are honored and maintained. Those recommendations are based on thorough research, extensive community consultation and reflect the points of view of a wide range of the ICANN community. Mindful of the potential implications even small changes to the framework could have on the wider community, the Working Group decided to make the draft document available to the community for review and comment before the working group formally publishes its Final Report. The Public Comment Forum closed on 19 December 2011, and the Working Group will closely review all submitted comments to determine if further modifications to the draft document are necessary. Geographic diversity is a fundamental component of the ICANN organization. The ICANN Bylaws (Article VI Section 5) currently define five geographic regions as Africa, North America, Latin America/Caribbean Islands, Asia/Australia/Pacific and Europe. The ICANN Geographic Regions were originally created to ensure regional diversity in the composition of the ICANN Board and were subsequently expanded in various ways to apply to the GNSO, ALAC and the ccNSO. ICANN staff is preparing a summary report of the comments submitted to the Public Comment Forum. That report will be posted in the forum and shared with the Working Group. Working Group members will closely review all comments submitted and will determine whether to modify the recommendations in the Final Report. The Working Group expects to formally publish its Final Report later this year. At that time the various ICANN Supporting Organizations and Advisory Committees will be asked to formally comment on the recommendations in the Final Report before the ICANN Board evaluates the report. AFRALO has experienced a noticeable increase in activity among its At-Large Structure (ALS) representatives since it held a series of capacity building sessions during the ICANN Public Meeting held in Dakar, Senegal, in October 2011. According to metrics gathered by AFRALO leadership, 2011 participation of ALS representatives in AFRALO monthly teleconferences has increased by 30 percent from October to December 2011. Accordingly, AFRALO also expects to see a greater participation of ALS representatives in the At-Large policy development process as well as in At-Large Working Groups. As AFRALO continues its outreach activities, it hopes to see other organizations of African Internet end-users become interested in ICANN and seek accreditation to become an AFRALO ALS. 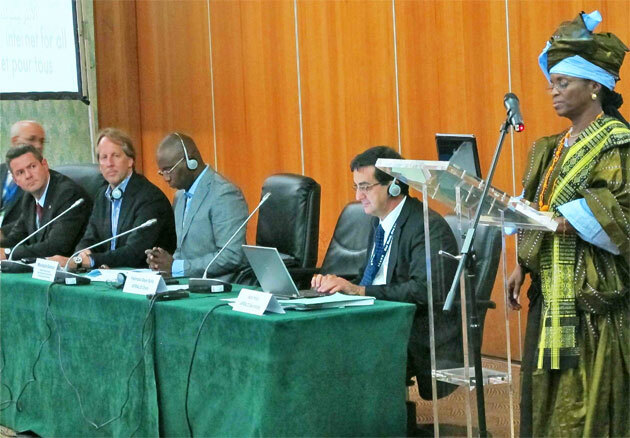 AFRALO Chair Fatimata Seye Sylla provides welcoming remarks at the AFRALO Showcase at ICANN's Public Meeting in Dakar, Senegal, in October 2011. Photo by Heidi Ullrich. AFRALO identified the main challenges it faces in gaining the necessary level of comprehension of the significant volume of policy-related publications and activities generated by ICANN. In 2009, an AFRALO Working Group produced a document outlining the capacity building needs of AFRALO, identifying them as follows: to inform and educate AFRALO representatives on ICANN activities, to increase understanding of ICANN policies and to establish a communication policy that reflects the realities of the African region. Through the agreement of several Regional At-Large Organizations, which pooled their fiscal year 2012 meeting support budget, AFRALO obtained the necessary funds to carry out its capacity building program in October 2011. More than 20 representatives from each of the African At–Large Structures attended the AFRALO Dakar Events series of meetings held from 23-27 October 2011, which included a series of capacity building sessions, showcase, general assembly and AFRALO/AfriCANN meeting. The showcase was very well attended with a participation of about 300 people. The weeklong capacity building program was considered a highlight of the event. Its main objective was to raise awareness of ICANN policies, organization and activities, to increase the effectiveness of the participation of the African end-users representatives in ICANN's policy development process. Over five days, the program aimed to provide representatives of AFRALO ALSes with briefings on the key policies, issues, activities and structure of ICANN. These briefings were conducted by ICANN officers and staff, and allowed for open discussion among all participants. The events were very well attended, with an average of 30 to 35 attendees per session. The ALAC submitted a record 40 policy statements in 2011. This marks a 60 percent increase in the development of statements from the already substantial 25 statements submitted in 2010. In addition to the significant growth in the development of policy statements, the ALAC has also increasingly incorporated comments from the five At-Large Regional At-Large Organizations and their now 138 At-Large Structures. ICANN receives input from governments through the Governmental Advisory Committee (GAC). The GAC's key role is to provide advice to ICANN on issues of public policy, and especially where there may be an interaction between ICANN's activities or policies and national laws or international agreements. The GAC usually meets three times a year in conjunction with ICANN meetings, where it discusses issues with the ICANN Board and other ICANN Supporting Organizations, Advisory Committees and other groups. The GAC may also discuss issues between times with the Board either through face-to-face meetings or by teleconference.